Sorry we haven't updated. I was hoping Frank would. Maybe next time. We were happy to be home so he could be sick in his own bed. Acutally, it's the couch. The couch in our kitchen is his favorite place to lay down. He ran 103 Tues and Wed. Thursday he ran about 100 and by that evening he was normal again. Yeah!! He had labs drawn at West. White count was up a bit, because of the growth hormone factor shot, and everything else has dropped again. Platelets are 63. Please pray his blood counts will get better before going into this next treatment. He doesn't like getting transfusions. He went to work Friday but stayed in the office. No sales calls in hospitals. There's sick people in there!! He found that out the hard way! We watched Memphis play Friday with some youth leaders from church. Zach went out of town for a soccer tournament. Chandler's socializing tonight. Chase is hanging out with cousin Jimmy. Frank made a good soup out of the left over Easter ham. Normal stuff!! And that feels so good. We had an emotional week. But we've had good come out of it. We are praising God for some very specific prayer requests that we've had for our family. The kids are hurting and scared. But we are so thankful for the honesty that's started some great conversations. Who would of thought that they didn't think we were scared too? Cause we never told them we were! Oh, this journey that we're on.... we need grace, and mercy. I know I do! I have never been more aware and appreciative of our community. I don't mean Memphis and Germantown. :) I mean friends, family, church, youth leaders, school administrators. God is using each one to minister to our needs. I know it's from Him. We are so very thankful for each one of you. Please pray for Frank's body to get stronger each day. For each one of us to be secure in the presence of God and His love for us in our lives each day. For the kids to have a window into their own heart as we talk through things between us. That Frank and I would have wisdom and sensitivity as we deal with each one where they are. Psalm 40:5 "O Lord my God, You have done many miracles for us. Your plans for us are too numerous to list." After going back and forth with everybody all day yesterday… we were frustrated to tears. Last night was rough. We both took something to help us sleep. He was chillin’ and shakin’ with 103 again. We put our ipod speakers in the bed with us and listened to worship music (and touched toes) until we fell asleep. After the labs today, we talked with Deena and we finally got a plan. His WBC dropped again from 1.7 to 1.2. Fever still high. So, we had an appt to see a Dr. Kiwan. I think he's the infectious disease guy. He was going to see us, determine from labs and MRI that is wasn’t disease process involved and then “petition on our behalf” for Dr. B to let us come home. Frank and I prayed together in our room. We asked God for specific things and ask for peace about the decisions being made for us. And then headed over to see Dr. Kiwan. He still feels crummy, fever 101. .
All of the sudden, Dr. Barlogie comes in. We weren’t supposed to see him. We were thinking this was about to be a bad scene and that we’d have to beg to please go home. He came in and was as calm and sedate as I’ve ever seen him. Oh my! That was such a God thing!! We just stared at each other. God took the desires of our heart and just gave them right to him. No argument. No more tests. So, Praise the Lord!! We are on our way home. We’re packing up the apt and turning in the keys. Labs at home. Special labs for tumor markers will be drawn and mailed to them. We already have a return visit for April 7th at 9am. Yippee!! It wasn't too long ago, that I talked about the roller coaster of emotion, right? We hope each of you enjoyed your Easter Sunday. Our's was a bit different, but still good. Frank started running fever Friday just before we picked up the kids from their trip. His fever's been going up since then. He's on oral anitbiotics, antivirals, and Tamaflu. He's barely gotten off the couch all weekend. Well, he did actually sit up to watch the Memphis vs. Miss State game. :) But then he layed right back down. I stayed home with him on Sunday. But the kids went to church. Last night his fever went up to 103, so we made the decision to come on back and just play if safe. Best case senerio: it's the flu... come home. We gained peace of mind. Anything worse than that: we needed to be here anyway. So, we left at 11:50 pm. We were unpacked and in the bed asleep by 2:15. Don't do the math. It'll embarrass.. um... the driver. So, it's Monday and we're here. We got labs drawn. Good news!! It is only the flu. Influenza Type B. Whatever that is. His white count was down to 1.7 ~ so technically neutrapenic. His platelets ~ 79. All else looked pretty good. He got a bag of fluid. His fever is still up. Deena told us, she feels confident they would delay this next treatment until he's over this and has been fever free for at least 48 hours. She called Dr. Barlogie's nurse to let her know we were here. We said our goodbyes and headed back to pack up the things we left in the apt for good this time. And she called back. She said Dr. B found out we were here and said "don't let them leave". *Dr. Barlogie will have perfect wisdom from God as he makes decisions about the timing of the next treatment. *Frank's body will recover from the flu with no complications from it. *That whatever tests they may want to run today can be done in a timely manner today so we don't have to drive back and forth so much this week. That way Frank can rest more, work some and I can get kids refocused on school and make up work before we come back for the week long treatment. This poem was in the Streams in the Desert book I've been reading. The days devotion was saying that whining about our problems and pain doesn't get us anywhere. We can only learn and help others when we experience victorious suffering. Lord, help us today to draw strength from everything that comes to us! Frank and I did make the decision to talk to the kids over the phone on ski trip. We didn't make the decision lightly, but it has been confirmed by many that it was the right choice to make. Chandler even told me so face to face. That has given us a lot of peace about it. It wasn't easy for them that night. There were many tears. But great good came from it. They were ministered to by the body of Christ is such a precious way. They came together as a family for each other. Not just the 3 of them, but cousins, and aunt too. And it taught them, as so many rallied around them, that they are never alone in this journey. And they did what we prayed they would do.... they had the freedom to "just let go" up on a mountain and work some things out. As a mom and dad, we want to be the ones to fix all their booboo ~ even booboo's of the heart ~ but life isn't that easy sometimes. Unfortantly at 12, 14 and 15, they know that all too well. They are home now. And we are so happy to be together. My niece is here from DC too and we're going to cheer on the Memphis Tigers together. Yahoo. Frank is all smiles today. He's been working, making sales calls and doing what he loves to do... be at Elliott. He's loved that job and the people he works with for 19 years. He jumped up bright and early when we got home to hurry into the office. He got labs drawn from the our Memphis oncologist. WBC 2.3, Platelets 81. We want those to go up, so he won't have to get transfusions after this next treatment. For the hugs, emails, comments, cards, and prayers.... we thank you. "Cast all you cares on the Lord, for He cares for you"
It's been a hard day today. The roller coaster of emotions just seems to be the norm. We've been so excited to be coming home. Frank did beautifully during this transplant. We are so pleased with how things went. We woke up, packed the rest of the apt and headed to get labs drawn and see Dr. Barlogie. While in with him, he looked at the MRI first. It showed no change from the last one. Then he went to look for the gene array from the fine needle biopsy out of the new hip lesion from a few months ago. (fyi: the gene array is a detailed break down of the myeloma's DNA. Little Rock is one of few places that can do that, making it another reason it's #1 in the world for treating myeloma). He's been waiting on this for a few months. It helps them identify prognostic indicators, and determine low vs high risk, as well as aid their research in looking for a cure. The results were disappointing for us today. They confirmed that Frank's relapse is aggressive. It's high risk and requires a more aggressive treatment protocol. I cannot describe to you how a heart breaks for one you love dearly, and I hope you never have to find out for yourself. I love Frank so much. He was hoping to come home and just "get back to work and do normal stuff". But the treatment plan will be more than intense than we were anticipating. He has been working on a new treatment plan for high risk patients. He told Frank he was going to put him in Total Therapy 5 research program. He was first treated under Total Therapy 2. With #5 beginning, we found out Frank will be a charter member. We will return next Wed Mar 26th for a smaller dose of what he just had: Melphalan + VTD-PACE (all letters are a different chemo, so 8 in all). He will not need stem cell support to recover from this, so he can come home as soon as the chemo is finished. We should only be in AR for a week. We still have the same apt so that's good. (We just have to unpack the car and move back in). He waits 6 weeks, then returns to do that again. Then 6 weeks later, goes back for another transplant like he just had. At that time, Dr. Barlogie talked about trying to harvest stem cells again so he'll have some more. Right now he has 17 million in 3 bags frozen. Then a year of consolidation chemo on a monthly basis. This website is to keep us connected with our loved ones and friends. It's not about saying what we think sound good. We hope we're "keeping it real" as Randy Jackson would say... and on that note.... hearing all that was not easy. It hit below the belt. Frank was mad. Mad about the loss of control he feels over his life, and his ability to be a husband and father, and a good and productive employee. I am scared ~ about so many things... couldn't even begin to name them all. This was just not what we expected. We turned off our phones and took some time. We drove home and had dinner at Bone Fish for my birthday today. (Happy Birthday to Frances, too). We called the kids. We decided to tell them even though they are skiing, and trust God's timing. They are on a church trip, on a mountain, and have the opportunity to work out their emotions there on their own, away from here. Our pastor is there, their dear leaders and best friends that love them, and family is there too. We had a real peace about going ahead with that. My prayer is that they do work some things out. Cry, scream, pray, do what ever it takes. I want God to meet them where they are in a real way for each one of them. 2 Corinthians 12: 9 Paul asked for his thorn to be taken away... "And He said to me, 'My grace is sufficient for you, for My strength is made perfect in weakness.' Therefore most gladly I will rather boast in my infirmities, that the power of Christ may rest upon me." I believe this, and claim it for Frank and for our family.... will you join me, please? He's here getting the daily blood work. He has an MRI at 1 today. Then we'll see Dr. Barlogie at 11:30 tomorrow. One more night in the apartment. We are praying for wisdom and God's hand to specifically guide the next phase of treatment. Quantifying remission is a little more difficult now. We have rested in the word itself so much, that we're having to readjust our thinking a bit. After talking with a nurse about how to know when Frank is in remission, she was explaining that we'll rely on radiology now to determine where he stands. But once you have a lesion, it can take up to 18 months before you see it change or heal itself without any disease process going on. So, it's more of a subjecive call on the doctor's part. So future MRI and PET scans will guide them in future treatment plans for Frank. Frank is back to normal. High energy, ready to get things done, perky and cheerful. The house was so quiet with the kids gone on the church ski trip. Moses, our cat is the only one making noise besides us. We cooked dinner and watched one of Frank's favorite movies last night. Let me clarify... one of his favorite movies with no killing and fight scenes. We watched Alex and Emma. I will pray, and cry aloud. from the battle that was against me." Thank you for praying for us. We are so grateful and overwhelmed that this transplant went so smoothly. Thank you Lord!! Today was really something. Sandy and I got up real early, stopped at Shipley Donuts, and arrived at the hospital around 7:30am. The donuts were a bribe for the staff on 7C and it worked, because we didn’t have to wait long. Before we knew it I had given blood, had my vitals checked, and was in a reclining hospital chair waiting on the results. There was definitely a motivating factor for our actions. On Friday, my APN Deena mentioned that if my lab values were stable enough, she would let me go home until Monday. We had done all that we could, it was now up to the lab….and well, I got paroled ! I was so happy I ran out of the room and down the hall yelling “I’m free, I’m free, I’m free”. Then I turned around and went back because I had left my coat and my mother-in-law in the room. I found out later that no one had ever done that before. What can I say? I’m a trend setter. So, today was really a good day. We left the hospital, packed up quick and hi-tailed it to Memphis. Great timing too, because we got home just in time to see the kids off as they left on our church’s Ski Trip. After that the afternoon was filled with regular ol routine stuff, but if you’ve ever been away from home for a long time, you can relate…it just feels good to be in your own home. So for now the plan is to rest up and report back on Monday for more tests and an MRI in the hopes that the values will impress Dr. Barlogie on Tuesday. If he likes what he sees, then I’ll be getting discharged!!!! Yippee.... yippee.... Frank's doing SO good! Last night his back was aching and pulsing. Zach would put his hands on his back to try and feel it. I've decided that's the man version of trying to feel a baby kick! Frank's saying.."there, can you feel it?" Zach's like, "it think so, is that it?" Very funny. He's been aching all morning as well. That's good, because that means the bone marrow is generating cells ~ and it is! If they drop any more he'll get some tomorrow, but Frank has a twinkle in his eye like he's trying to say he thinks he won't need them. The CRP level we are concerned about went all the way down to 7.72 today! That's great! That's the value that measures inflammation. So, whatever made it shoot up to 15, (which Deena admitted today scared her) seems to have been taken care of with the GI meds and antibiotics he's been getting. We're still in IV antibiotics every 8 hours at the apt. He's got a spring in his step. We've got the windows open, I'm cleaning, changing sheets, etc... (It sure is a lot easier to clean an apt) Frank's even making sales calls for work! Frank's patience is tested at this point in the process. He's feeling better and ready to go home. Deena just laughed today and said, "I'm not letting you go until I'm good and ready..."
He told me yesterday he thought he's be home by the weekend. Telling him that wouldn't happen was like telling a little kid there was no Santa Clause. We see the doctor next Tues. It would be wonderful to be home for Easter. That a great goal! Thank you so much for your faithfulness to pray for our family. We are blessed indeed. And thanks for the comments you post and for the emails. They really do mean a lot to Frank..and me! We got an early start this morning. And you know what they say about the early bird.... we left encouraged! Frank had fever last night but the meds they gave him must be working. His CRP level did drop some to 12.24. WBC went up a bit to 0.13. But the others seem to be dropping still. He got an infusor of Phosphorous and Potassium today. They were low. We are going to do IV antibiotics every 8 hours here at the apt. I hook them up for him. He gets annoyed with the "bottle" connected to him all the time. But it's nice that he can get those meds here. Deena was very encouraging today and said she thinks he's doing fine. She feels better about his labs. Keep praying that CRP level goes down. We are so thankful!! Have a wonderful day! He rides upon their wings." Chandler went with us today.... We've enjoyed having them with us. I only wish Frank was feeling better. His fever went up to 100 last night, but it broke about 3 am. No fever at the hospital today. Chandler, Frank and I had bets on what his levels would be today. His CRP shot up from 3 to 15. That got everyones attention this morning. They drew blood cultures from his arm and his port. Ordered a doppler study on his arms near his port, and put him on 3 different IV drugs. Did I mention the Infectious Disease Doctor is one the case now? We are very thankful that they watch him so closely. Neither Frank nor I are too worried about this at this point. Frank seems to do this with every tranplant, and they never find the source. It just goes away. His stomach is bothering him some, so they have him on IV Reglan here at the apt. Tomorrow, we'll have around the clock IV antibiotics to supplement what he gets there. His fever was high as 100 tonight as well. They redid the CRP level before we left today and we called for the results. It went up slightly from 15.02 for 15.24. They were hoping for a decrease, but it's basically the same, so I think that's good news. Frank is feeling pretty good despite all the commotion going on around him. The stairs are getting difficult but he seems determined... we skipped the first 4 flights today, but worked hard for the other 7. We watched American Idol tonight and he still voiced his opinions. We are enjoying being together... all under the same roof. Chase drew pictures for him tonight put them on the bathroom mirror. I do miss home. I miss Moses and Casey. But I feel extremely blessed. We get to snuggle with the kids whenever we want. Let you mercy, O Lord, be upon us, just as we hope in You." Please join us in prayer that Frank's fever would go away. And that if there is anything to be found, they will find the source quickly. We pray for wisdom for each person that evaluates his case... from nurses, to labs, to pathology and so on. Zach went with us to the hospital today. I love it that they are each getting their own time with us there. Frank did start running fever today. It was 99.7 at the hospital and about the same since then. They started him on IV antibiotics to go along beside the oral ones he takes anyway. Platelets 39 Wow.. good transfusion. The CRP level went up more to 3.04, so they were asking him about signs of infection other than the fever. His Magnesium was low, so he left with an infusor. He stayed in the bed most of the day. Neat thing... A friend of Chandler's piano teacher lives here. She's never met us, and cooked dinner for us and brouht it over. The kids loved it... we all loved it! So sweet. This is just another way that the body of Christ amazes me. Please pray Frank's fever goes away and stays away! Well... we forgot to set our clocks back...did you? Chandler and I had hopes of going to the work out room this morning, but... you know what happens with the best laid plans? Chase went with us to the hospital today. You have to be 12 years old. He was proud that he "made it". His counts dropped a little more today. Platelets 14 ~ so he got a bag today. Chase and I prayed with him, that there would be no reaction this time. (he had 2 last time) And we are happy to report that there was not!! Thank you, Lord. The pre-meds they give him makes him sleepy, so that's what he's done since we got home. His potassium was 5.2, high. And his CRP level was 1.33, a little high. That is a lab value that indicates an infection. It's only slightly elevated. If if went up, they would start looking for a source of infection. But they aren't concerned now. We had a great evening last night. We drove around downtown to find a place called "The Flying Fish". Frank can't go in anywhere yet, but we grabbed a menu, and we hope to have a celebratation dinner there soon! We watched a movie and enjoyed looking through old photo albums I brought. ~ that the stem cells would begin to migrate out and bring up the counts in a few days. Frank's doing well. Finally neutrapenic. It is amazing to me that he appears to be so normal looking, acting, etc... and know his blood counts look like this. His blood pressure is a little low, heart rate a little high, but all that is normal to them. We did meet with Dr. Barlogie yesterday. He said everything was looking like it was suppose to at this stage in the game. The MRI showed stable lesions. No change from the last one. So, that's great news that they aren't any bigger. They'll do another one before we leave to check again. Frank asked Dr. Barlogie about follow up treatment afer this, but he didn't have a solid answer yet. He threw out some ideas but said he wanted to think about it. He hugged and kissed us all, and enjoyed Frances' southern draw. We still park in the farthest parking lot and still took the stairs... 11 flights in all. Thursday ended up being a whirlwind of a day! Frank's mom got into town early afternoon. My plan was to go home, stay Friday to catch up on bills, etc and get kids packed up to come back here after school let out of Friday. And then came the snow forcast. So, I left Little Rock at 4, ate dinner, visited with friends, grabbed the kids, packed the car (thank you Kristy and Lute) and left at 8 to get back before the bad weather hit. We were back in Little Rock by 10:30. That hour and half home was the fastest hour and a half of my life! We hadn't gotten to see the kids in over a week. It was good for us to be under the same roof. And we hope Momma got some rest. She slept late Friday morning, and loves the snow, so that's good! 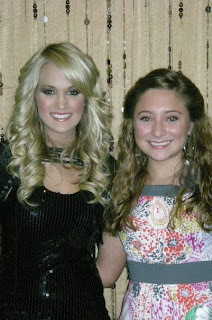 And here is the picture we promised of Carrie Underwood and Chandler. Her, Alexis and Lisa had a good time. Happy Birthday to Chase! He is 12 years old today. That is a reason to celebrate. For Peggy and I, being away from him today is a disappointment, but we are so proud of him and look forward to seeing him and the family soon. Yes today we are thankful. Thankful that dispite the disappointments we have faced concerning this disease, I have had many successful strides in my treatments. Chase was 6 years old when we first started this fight. Although the effect this has on all 3 of the children weighs heavy on our hearts... many a tear has been shead, many more prayers as well...... Chase's age stands out as a milemarker for us. One of my deepest fears has been that I would pass at such a young age that Chase would not remember "his dad". When he was 6, memories of me would have been scant. We are off to get blood drawn now, his levels went up yesterday.... shocker. We were stratching our head yesterday wondering what that was all about. But Dina, our APN said that can happen. Sometimes you see a slight rise after stem cells are in. That's never happened before... just when we think we know this routine like pros.... we learn something new. We are hoping the MRI results are in today. We found out more information about why they are doing this. This, too, is a new thing. It's because his myeloma in now a non-secreting type. This means it doesn't shed the protein that is detectable by blood or marrow anymore. It's invisible in a loose sense. So, they have to look for it in other ways. This MRI is to see if the chemo was successful in shrinking the lesions that they found. *for safe travel as we get the kids tomorrow ~ we are suppose to get 1-3 inches Fri. We are READY to see them. If I have to bob sled to Memphis, I'll do it! ~ and for Frances as she comes to see us today. * that God would give the kids a peace as we are away, and that they would surrender to let Him meet all their needs. We are blessed to have the body of Christ care for all our needs so tenderly. Thank you for all you are doing. We woke up to snow this morning! It was so pretty. Our unit is in the back, so we opened up the blinds, watched the news from bed and watched it snow into the woods behind us. Refreshing. We are overwhelmed with emotion today, no particular one ~ a potpourri really. Frank is thoughtful and reserve this morning, and sweet as can be. His counts are coming down faster than we had expected. He'll be neutropenic tomorrow. That means he'll have to wear a mask, no going out in public, no fresh fruit or salad, etc. His stem cells ran a little late, but they are in! The whole process takes about 5 minutes. 6.01 million in 54ml. That's a packed house! Standing room only. We actually took a vidoe of it. But it was too big to upload. I tried! Dina is our APN. We adore her. We've known her for 5 years. She is precious and we are happy she is with us. She did Frank's 3rd tranplant as well. Frank has to be at the hospital by 1:00. We have a prayer request. His port-a-cath won't let them get a return. Fluids are going in, but they can't draw back and get any. The chemo is hooked up to it now, and is infusing. But if they can't get a return on it today, they'll put TPA in it to try and unclog it. We are praying that the port will continue to work properly so he doesn't have to have a triple lumen catheter inserted. He gets disconnected from the bag today. He feels good but he's pretty much sleeping all the time now. It's raining here and yucky, but I'm going to try to get him to walk on the treadmill since we've walked every day so far. 8:30pm Well, the port didn't preform like we'd hoped. They put in the TBA. Which is no big deal really. We want it to work though... we'll know in the morning. Tomorrow is the day... he'll get his stem cells around lunch time!! They'll only take a few minutes to infuse. Then they'll swim to the bone marrow, work really hard to graft and then migrate back into the blood stream as red and white cells and platelets. They said his counts should bottom out between Thursday and Sunday, and then we should see them come back up. God often seems to place His children in places of deep difficulty, leading them into a corner from which there is no escape. He creates situations that human judgment, even if consulted, would never allow. Yet the cloudiness of the circumstance itself is used by Him to guide us to the other side. Perhaps this is where you find yourself even now. Your situation is filled with uncertainty and is very serious, but it is perfectly right. The reason behind it will more than justify Him who brought you here, for it is a platform from which God will display His almighty grace and power. How appropriate a message for anyone that finds themselves in a desperate position. Once again I choose to cling to Him and see where this journey leads…. "I Peter II 5:6,7 Humble yourselves under God’s mighty hand, that he may lift you up in due time. Cast your worries on Him because he cares for you." Our God is faithful; He has proven this over and over to me. going to try and walk as much as he can. It helps keep you strong and muscles from losing tone. We've had little things happen in the apt। Most of them we've tried to ignore, but the "list" is now long enough that finally went to the office. They were sweet about it. The biggest frustration is that we haven't had internet. (Well.... it's been hit or miss. We've been stealing broad band off someone near that is wireless and unsecured, but I think they got wise to us this morning.) The DSL wasn't suppose to get hooked up until yesterday, but then the modom was broken, and they said it would be another week! After talking to them today, a new modom should be waiting for us when we get home (we're at the hospital now), and new mattresses on Monday, (frank and i would roll and meet each other in the middle) and a new TV, and we already got a new set of dishes (we only had 2 dinner plates when we got here). Hopefully things will be better by the weekend. Okay, just needed to vent! All that only leaves me with one thought: "There's not place like home!" But with all seriousness। We are thankful to be here. This is the best place we could be for Frank. Frank and I are here at the hospital as I type। His port-a-cath is not working right. The chemo is going in okay, but the nurse can't get her blood sample. They may have to put TPA in it ~ it's like heparin but alot stronger. Frank is feeling really good। Some fatigue, and a few other minor side effects from the Dex, but other than that, all is well. He's getting the "red man" syndrome. The Adriamycin is red and makes him look like he's been out by the pool all day. Funny thing is it actually makes him look healthy I think, rather than pale. Chandler is on her way to Biloxi with my sister Lisa and Alexis। Lisa had an extra ticket to see Carrie Underwood concert. Not only are they on the 2nd row, they have back stage passes to meet her. I hope I have a picture to post. I am so excited for them. Frank may be turning red, but I'm as green as can be!! I am trying to move us to a new website that is easier for me to manage. I don't know how to use HTML, which keeps me from doing things I want to. I had to copy and paste EVERY entry from 2003 into the new blog site. Very tedious process and I've put all my spare time into it since last Sunday, but it's done now. I am trying to get help from Frank's tech guy to redirect the site so we can still have carltongang.com. The reflection was so good for me। I have relived 5 years in a week. It's a roller coaster of a ride ~ more on paper than we feel in real life. But it was such a testimony of God's watchcare and His provision over us over all these years. We are truly grateful for all He has done, and for knowing we don't walk this alone. Thank you. Here's the important thing: Make comments at the end of the blog. Don't use the "guestbook". That will help out a lot in transferring info. Be strong and bold. Do not be afraid or terrified because of them, for the Lord your God goes with you; He will never leave you nor forsake you.